Wright wanted to create a complex uneven surface to bring out light and shade and choose grey and green carved Oya stone from Tochigi Prefecture to accomplish this. The architect had another, far more important, reason to use this stone. Wright was very aware of the danger that Japan’s earthquakes posed to heavy buildings and wanted to make the Imperial Hotel as earthquake-resistant as possible. The plot covered a thick layer of mud and Wright decided he would make the Imperial “float upon the mud somewhat as a battleship floats on salt water.” His reasoning was simple: “Why fight the force of the quake on its own terms? Why not go with it and come back unharmed? Outwit the quake?”2 This required light building material. The light-weight lava stone from Oya was perfect for this. 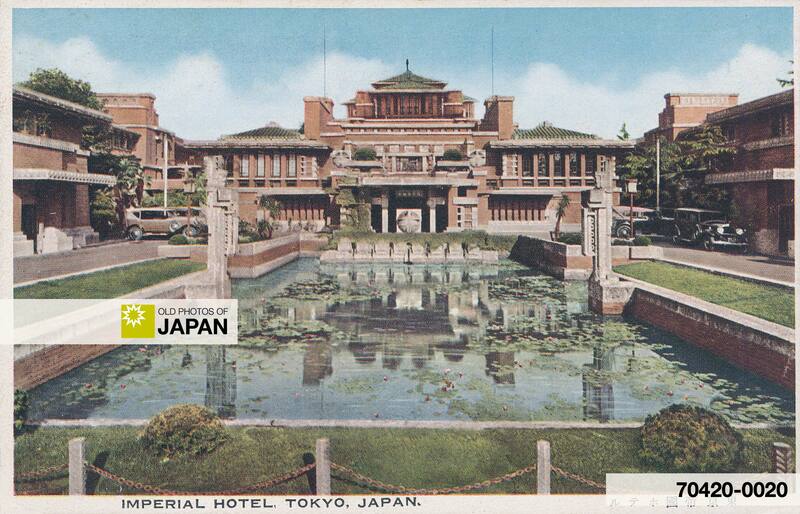 When the Imperial Hotel opened on September 1, 1923 (Taisho 12), however, Wright was vindicated. That day it was hit by a magnitude 7.9 earthquake that devastated Tokyo, Yokohama, and the surrounding prefectures of Chiba, Kanagawa, and Shizuoka. Over half a million homes and buildings were destroyed, over 142,000 lives were lost. Wright’s Imperial Hotel had survived. The reflecting pool that he had specifically built to provide a source of water for emergencies, and which had almost been cancelled because it was seen as a waste of money and space, had helped stop a raging fire. The hotel became instantly famous all over the world. The event had an interesting side effect. It would change how Japanese got married. Wright’s Imperial was not the first building to carry that name. The first Imperial Hotel was opened on November 20, 1890 (Meiji 23) to cater to the increasing number of Western visitors. The hotel lost money at first and had to become innovative to survive. When Crown Prince Yoshihito (1879–1926), the later Emperor Taisho, married on May 10, 1900 (Meiji 33), he did so in a Shinto ceremony at the Imperial Palace. This made Shinto weddings extremely popular, and the Imperial Hotel saw an opportunity. It set up a shrine-like altar and offered Shinto weddings followed by a reception. Shinto priests, however were not amused. Many balked at performing a Shinto ceremony at a Western-style hotel. The Great Kanto Earthquake of 1923 destroyed their shrines though and the hotel was one of the few places where Shinto-style weddings could be performed. The number of weddings at the Imperial shot up, and the hotel ended up building its very own shrine on the premises, the very first hotel to do so. This has become a regular feature at many large Japanese hotels, which now offer complete wedding packages featuring even makeup and hairstyling services, and photo studios for wedding pictures. In 1967, the Imperial Hotel was demolished to make room for an ultra-modern high-rise structure. Wright’s main entranceway was preserved and moved to the Meiji-Mura museum near Nagoya. Here it still stands today, complete with the reflecting pond that Wright fought so hard for. 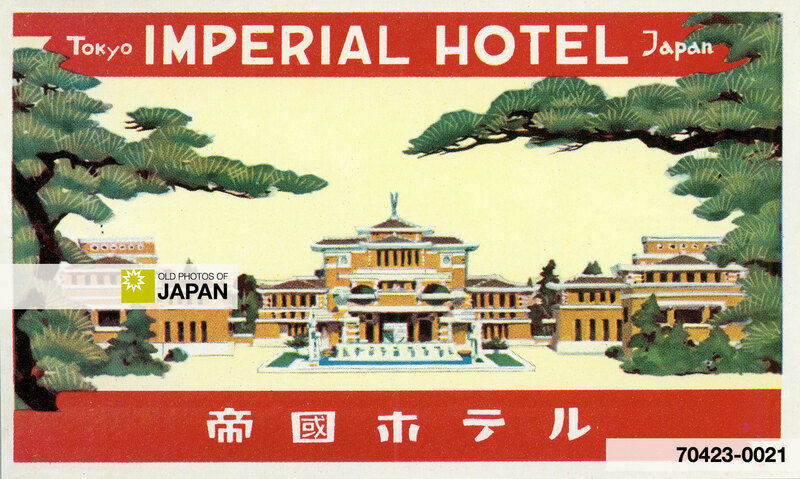 An early luggage label for Wright’s Imperial Hotel. 1 Frank Lloyd Wright designed some 14 buildings for Japan, of which six were built: the Imperial Hotel, its temporary Annex (1920), the Jiyu Gakuen School (Ikebukuro), the Aisaku Hayashi house (Tokyo), the Arinobu Fukuhara house (Hakone), and the Tazamon Yamamura house (Ashiya). Four structures remain: the Jiyu Gakuen Myonichikan, the Tazaemon Yamamura House, the front lobby of the Imperial Hotel, and a portion of the Aisaku Hayashi House. — Severns/Mori, Window on Wright’s Legacy in Japan. Retrieved on 2018-02-23. You can also licence this image online: 70420-0020 @ MeijiShowa.com. Hi Kjeld, I found Old Hotel Luggage Tags from the New Mori Hotel. in Tokyo, Japan. I’ve been Looking on the web & on e-bay looking for some info on the Hotel. my guess that’s it’s from the 1950’s???. on the back of tag is a small map & says conviently located to downtown near Shinagawa. I did some searching, but can’t find any info on the New Mori Hotel on internet… And I have never heard of it. Possibly, there are old phonebooks that list this hotel.